There has been an improvement in the status of a 13-year-old boy who was one of two victims in the brutal stabbing attack in Jerusalem's northern Pisgat Ze'ev neighborhood on Monday afternoon. However, the boy - who was stabbed repeteadly by two Arab terrorists aged 13 or 14 who were eliminated while conducting their attack - continues to be very seriously wounded. He was admitted to the emergency medical unit while on an artifical respirator, and underwent surgery for several hours. The second victim of the attack, 25-year-old Yosef Ben-Shalom who was caught unaware by the two terrorists and stabbed repeatedly, is likewise on an artificial respirator and is seriously wounded, albeit in a stable condition. Eliyahu Ben-Shalom, the brother of Yosef, told Army Radio on Tuesday morning that "his condition isn't good, he's in serious condition, but there's a great miracle that they stabbed him on the right side and not on the left side, mere centimeters from his heart." "The doctors said he should be several weeks in the hospital," added the brother. He noted that residents of Pisgat Ze'ev "want the routine to return to the neighborhood and to all of Jerusalem. This is a neighborhood that hasn't known a terror attack." 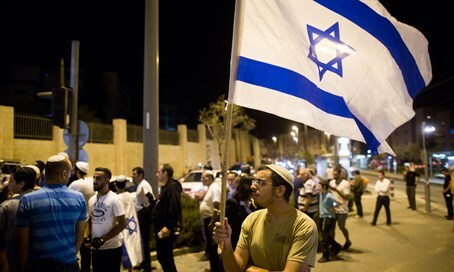 "We can't continue like this"
Arutz Sheva was on hand in Pisgat Ze'ev on Monday night as residents and nationalist activists protested, chanting, "the nation demands revenge," and "Bibi (Binyamin Netanyahu) retire, Jewish blood isn't abandoned." "We came out to protest like everyone else, as you can see we are in a state of fear, fear to send our children to school," said Tovi Harari, a resident of the neighborhood. "I haven't sent my daughter to school for three days already." "In my opinion the situation can't continue to be managed like this. There has to be some sort of solution. The prime minister must wake up, and understand we can't continue like this, they stab in the streets and we have no security," said Harari. "You can't walk around the streets, I don't remember there ever being something like this." Asked what her proposed solution to the Arab terror wave would be, she said, "if only I had a solution. The prime minister needs to think about it. To implement a curfew, I don't know...that's what he's prime minister for, and he needs to find a solution for us so that there will be quiet for residents of the neighborhood and in general." She noted that there have been terror-related incidents in the neighborhood in the past, "but not like this, where it's simply frightening to leave your home. ...Right now there's the protest so we all came together (on the street), but in general the streets are silent. No one is there." Harari pointed out that local store and business owners are being harmed by the terror wave because residents are avoiding the streets, and therefore are not out purchasing as much. Rabbi Mordechai Frizis, former chief rabbi of Salonika in Greece and an activist of the Otzma Yehudit party, told Arutz Sheva that "first of all it's our neighborhood, Pisgat Ze'ev. Unfortunately, I can't say that the terror only arrived now." "The Arab terror has been going crazy for a year and even more than that, in what are called the 'seam' neighborhoods (between Jewish and Arab regions - ed. ), also in Pisgat Ze'ev we have gunfire almost throughout the year, there are rocks, firebombs, and now terrorists arrived with stabbings," said the rabbi. "We say - the Jews and the Israelis who are loyal to the country who sit here in the land in the 'seam' neighborhoods - we say to the government, come and do what is needed to the end." "We've had enough. If they don't do what is needed, unfortunately as we see the situation deteriorates daily," emphasized Rabbi Frizis. Coverage of the protest, in Hebrew, can be seen below.